This is a great keyblade assortment, now with 65 different types of keys. These are the type that are used on many of the newer cars with a remote built into the key. There is usually a slot that holds the key in, and these keys all have that. This set includes 15 different high security keys. 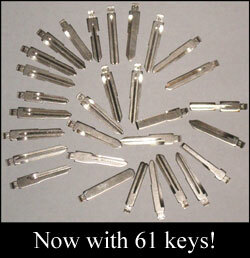 So, if need to progress or cut HS keys, and don't want to waste a normal key, these are great. If you'd like to order the individual keys, call or email. I'll list the high security keys here: #11 Mercedes 4 track, #13 Lexus long, #18 BMW 4 track, #20 Mercedes 2 track (new), #24 Volvo1, #25 Honda 4 track, #31 VW/Audi, New Chevy Camaro, #67 BMW 2 track (HU92), Volvo2, #38 Ford Focus (European) and more. This set includes keys from around the world!